UPDATE: A revised and extended discussion of this concept was posted on December 28, 2016. Important: Strongly affecting the course of events or the nature of things. 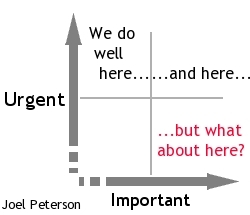 Urgent: Compelling immediate action or attention. 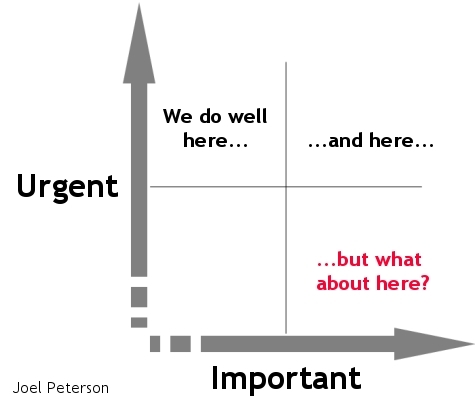 What's important isn't necessarily urgent...and what's urgent isn't necessarily important. We all have plenty of urgent matters we're compelled to deal with, despite the fact that they don't really have much bearing on the course of events. But what about those truly important matters that go neglected because they don't compel our immediate attention?